Which is the Right Hair Color For You? Hair color correction is a service frequently offered in salons everywhere. The reason: over-the-counter hair coloring products have given consumers the impression that hair color is easy and extremely affordable. One look at a professionally-colored model on a commercial or glossy magazine page, and many people clamor to the closest drug store to purchase a $5 box of color with the hopes of receiving a $50 salon look. 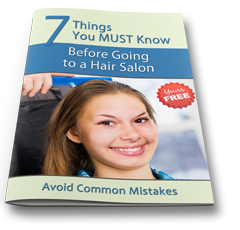 The results are often disastrous, and it can take hundreds of dollars to correct a hair color problem that could have been prevented with just a tiny bit of knowledge and planning. The most common problem seen with hair coloring at home and in salons is choosing a hair color that is too light for the natural shade of hair. Realistically, color can only lighten hair beautifully by a few shades. If you go any lighter than a few shades, you need to choose a high-lift product such as bleach or a professional highlighting system. Failure to do this often results in hair color that is much too brassy or even orange. High-lift hair coloring should only be performed by professionals. The controlled chemicals used in the process, if used incorrectly, can result in irreparable damage and/or chemical burns on the scalp and skin. Another hair color mistake that is seen quite often is choosing a color that is too dark. Extremely dark hair color can be the most challenging to correct because dark color can actually stain the cortex (inner layer) of the hair, making it almost impossible to lighten. Again, avoid choosing hair colors that are more than a few shades darker than your own to prevent a costly cortex stain. When it comes to choosing the right shade of hair color to use, pick tones and shades that flatter your skin tone. Choose warm shade of hair color (reds and warm browns) if you look best in warm-colored clothing such as reds, pinks and oranges. Choose a cool shade (beige, pale blonde highlights and neutral colors) if you look best in blues and greens. As you can see, just a little bid of planning and knowledge can save you from costly hair coloring disasters. And by making an informed decision before you purchase hair color, you will not only save money, you will also save your hair from needless damage. Hair color is a chemical, and every time you chemically process your hair, you damage it to some extent. The damage can be minimal, as is usually the case with high-end professional hair coloring systems, or can be extreme. And each time you use hair color to correct a problem, you are damaging your hair even more. 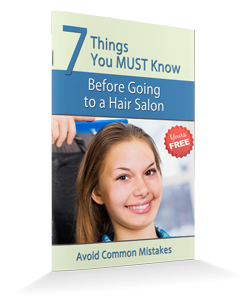 Here are just a few tell-tale signs that your hair has been over processed with hair color and other chemicals. The hair is limp and dull, and no amount of styling can bring back its luster and bounce. The hair is extremely dry and brittle. When it is wet, it is almost impossible to comb it without causing breakage. You can avoid damage to your hair caused by hair coloring by taking the same precautions recommended for choosing the right hair color. Choosing the right hair color reduces the amount of color applications, therefore, reducing the chances of your hair becoming over processed.